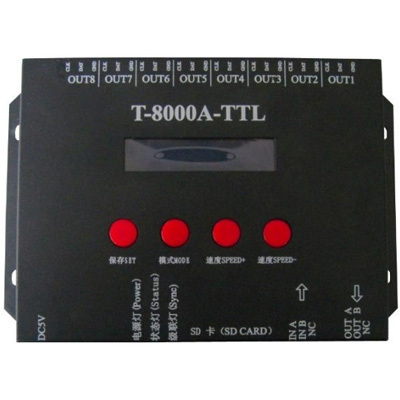 T-8000A LED Controller can support many IC ,such as LPD8806,WS2811,APA102,APA104,SK6812,WS2801 and so on . one port can control 512-1024 pixel . 4. Off-line (SD Card) control, can be multiple controllers used in combination, play back content stored in the SD card. 5.T-8000S store a maximum of 16 programs，copy multiple files to the SD card in order,after formatting the SD card as “FAT” format. 6. The program must be named in orders ,just as ：00_1.led, 01_1.led, 02_1.led. 7. 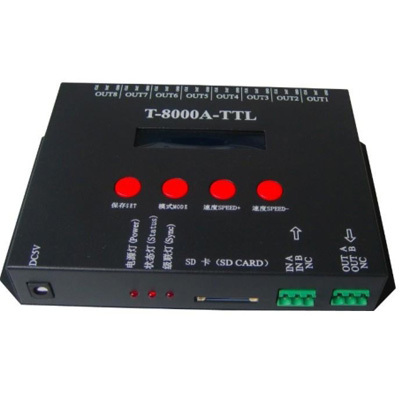 Compatible with single and dual ICs, if you control a single line IC LED lights, without being connected to the CLK line. 8. New T-8000S have a screen, the controller can be encrypted to limit the times of use. than 512 lamps and less than 1024 lamps the frame rate will slow down automatically. T-8000S must use the new software LedEdit 2014.
adjustment button the file will in turn play. to the LED ground wire directly.